We’d love your help. 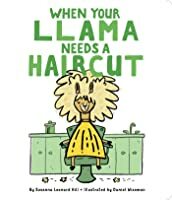 Let us know what’s wrong with this preview of When Your Llama Needs a Haircut by Susanna Leonard Hill. After a hilarious shampoo, it’s time to decide which style would be best for your shaggy llama. A When it’s picture day and you realize your llama needs a haircut, you’ll need a good comb and some luck! This charming and hilarious board book features one shaggy llama and a whole lot of hairstyles! To ask other readers questions about When Your Llama Needs a Haircut, please sign up. My Storytime gang LOVED this! Toddlers between 1 and 4 shouting out responses to the hairstyles under consideration, discussing how they like or don’t like getting their hair washed or cut! The illustrations are adorable and SO funny! When I found out my friend, author Susanna Leonard Hill, was releasing a new series of board books, I offered to review one. My friends know I'm not likely to give a favorable BOOK NOOK REVIEW unless I sincerely like the book I've been given. The day WHEN YOUR LLAMA NEEDS A HAIRCUT came in the mail, I was having a very rough time at work. I thought I would give Susanna's book a quick read and then delve deeper into it at a later time. I found myself actually chuckling out loud at some of the ad When I found out my friend, author Susanna Leonard Hill, was releasing a new series of board books, I offered to review one. My friends know I'm not likely to give a favorable BOOK NOOK REVIEW unless I sincerely like the book I've been given. It brougt me back to the days of my own youth when I tried wearing a perm myself, as well as those days of trying to tame my own son's curly locks. It is also written in a similar vein as author Laura Numeroff's "If You Give..." series which makes WHEN YOUR LLAMA NEEDS A HAIRCUT a very enjoyable read. I can't wait to read other books in the series like WHEN YOUR LION NEEDS A BATH and WHEN YOUR ELEPHANT HAS THE SNIFFLES. It’s always a joy to read a book that appeals to both kids and adults and “When Your Llama Needs a Haircut” does that! Simultaneously sweet and humorous, the story will tickle kids’ funny bones and possibly make them re-think the next time they have a tantrum about getting tidied up for a class photo. It will also bring back memories for adults from when they were little themselves and resisting grooming and haircuts (ah, the classic bowl cut…). And, honestly, who doesn’t love llamas? Daniel Wis It’s always a joy to read a book that appeals to both kids and adults and “When Your Llama Needs a Haircut” does that! Simultaneously sweet and humorous, the story will tickle kids’ funny bones and possibly make them re-think the next time they have a tantrum about getting tidied up for a class photo. It will also bring back memories for adults from when they were little themselves and resisting grooming and haircuts (ah, the classic bowl cut…). And, honestly, who doesn’t love llamas? Daniel Wiseman’s illustrations--bold line drawings paired with a soothing, slightly retro palette--have a fun, quirky feel that complements Susanna Hill’s amusing text. I love that the little kid is a person of color with hair as distinctive as the llama’s. Who doesn't want to look nice on class picture day? Llama, of course! Susanna Hill takes readers on a rollicking romp to try to make Llama look his best. All the cuteness is topped off with a fun, giggle inducing surprise. 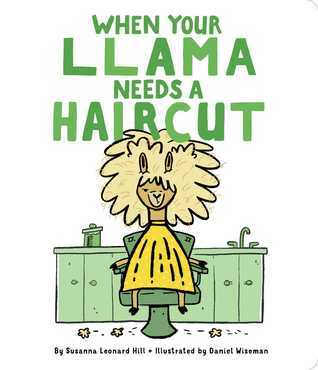 Illustrations portray wonderful expressions any llama would have when you decide your llama needs a haircut! Enjoy!! It's picture day. Who doesn't want to look dapper? Of course, llama does. To look his best, he'll need some help with the perfect hair style. Who better to help llama than a young boy who wants to look good on picture day, too. This delightful book is sure to have little ones saying, "Read it again!" The charming book is filled with colorful illustrations sure to entice giggles. This series is written in a similar fashion to author Laura Numeroff's "If You Give..." series. I look forward to read It's picture day. Who doesn't want to look dapper? Of course, llama does. To look his best, he'll need some help with the perfect hair style. Who better to help llama than a young boy who wants to look good on picture day, too. "When your llama needs a haircut, you have to be a little bit tricky. Llamas usually think their hair looks just fine." This text is paired with an illustration of the lama with flowers and twigs stuck in his hair. WHEN YOUR LLAMA NEEDS A HAIRCUT depicts a young boy's attempt to give his llama the perfect haircut for picture day. The comical options take us on a lively adventure - trimming a wiggly llama can get a bit tricky. But, in the end, Hill shows us that it's all about embracing the day. What a fun read! If the picture of the llama with a bowl cut doesn't instantly cheer you up, I don't know what will. Love, love, love llama and his lovely hair. Little ones will delight in Daniel Wiseman's adorable illustrations, and Susanna Hill's hilarious step-by-step story featuring the perfect picture day haircut. Or is it? School picture day is coming up and llama needs a haircut. Of course there's no easy way to get your llama to agree so you just have to grab him and go. The decision is which hair style to go with... bowl cut, mohawk, perm, or something completely different. To convince your llama you might have to demonstrate on yourself first, resulting in a hilarious school photo! A cute story about a reluctant llama who needs a haircut and the intrepid child who is trying to convince his llama to get one. Great illustrations and quite a fun read. This book is absolutely adorable! The whole series in now one of my favorites. If you haven't read this one, or WHEN YOUR LION NEEDS A BATH and WHEN YOUR ELEPHANT HAS THE SNIFFLES, check them out and you'll be smiling. Written in second person, this adorable story about a llama in desperate need of a haircut is sure to be accessible and entertaining to young readers. The third installment in the series (I love the allusion to Elephant and Lion in the class photo), this is my new go-to gift for babies -- and llamas. Adorable! If you have a llama, to be sure it will one day need a haircut. There are certain steps to be taken, of course, and something is sure to be challenging. Very enjoyable and funny story. Great (and funny) illustrations. This little board book explores all one's haircut options and culminates in a satisfying ending that may resonate with children. It's filled with light humor and gentle fun, and, best of all, it also speaks to a problem many children face. Super cute story about a llama who needs a haircut for picture day. I'm once again a little puzzled about the intended audience. This is shared in board book format but I would have picked a picture book just because I think the subject appeals a little more to preschool and up - but it's fun and cute and should be in the hands of little silly-book fans. Easy read about a llama who needs a haircut for the younger audience. Illustrations are very simple and support the simple text. This seems like another "How-To" book for young kids with a similar voice as many others. Llamas don't like haircuts, apparently. They think their hair looks fine the way it is. So if you want your llama to look good on picture day, follow these step by step instructions. A silly book that will go over well at preK storytime. Adorable! I wish this was available in a bigger size to read at storytime (it's only available as a board book). Funny thoughts on cutting your llama's hair and how, in this case, it turned into the little boy's haircut day too. Really good. PreK was very involved in this one and they loved the different hair styles. This is a super fun series of books!